Advantages: Interesting articles with authoritative text; informative reviews of the latest books and products; superb colour artwork and a 1:72 set of general arrangement drawings. Conclusion: A 34 page resource for the WWI aircraft modeller that offers a variety of subject matter, and is written by acknowledged contributors. 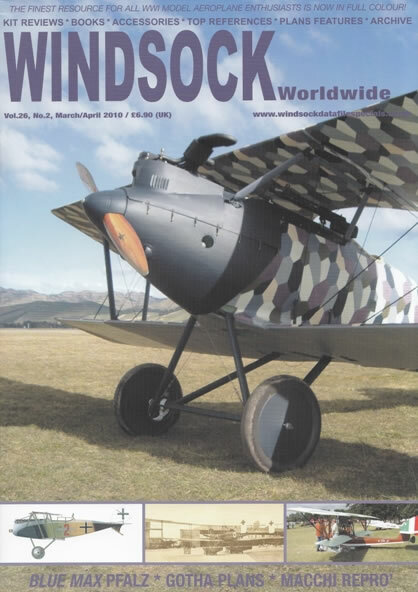 The latest issue of Windsock Worldwide is upon us and once again it contains something for all WWI aeroplane enthusiasts. Lance Krieg returns with another instalment in the “Master Class” series. This time he looks at the intricate world of cockpits and how best to represent them. Six pages are dedicated to this section and it’s complimented with colour photographs and illustrations on how to get the most from these areas. It’s part 1 on this theme with more to come in the next issue. Many will remember the 1966 film “The Blue Max”. Encore Models has released a kit of one of the featured aircraft. It’s the “lozenge” Pfalz D.III, and along with the review, the author takes a look at other aircraft that took part in this American classic. The recent new tooling of the Karaya Halberstadt CL.IV has been well received and there’s plenty of supporting material here for the modeller. The kit itself gets a detailed looking at, and is supplemented by 3 superb profiles from Ronny Bar. Not forgotten is a double page “walk-around” of a surviving machine to allow the builder some extra close-up information. “Rara Avis” takes a look at the huge Gotha WD.14. This aircraft was designed to deliver torpedoes and could be considered a WWI version of the “Swordfish”. Ian Stair’s 1:72 scale drawings are provided, as well as 4 captivating photographs. Interested parties that enjoyed the article on the Albatros G.II/G.III will be pleased to see a further 7 photos that weren’t available for publication in WS 25/5. Following this is a spread on Jason Petroelje’s amazing flying scale Macchi M.5 and Henning Opperman’s inspirational diorama of the 1914 Christmas Day raid. The extended review section looks not only at kits, but at books, decals, and accessories as well. All this translates to another welcome issue that will delight every fan of First World War aircraft.